Doctors are warning that contraceptive access is at a “crossroads”, with services being cut across England. Figures seen exclusively by the BBC show half of councils have cut, or plan to cut, services, particularly affecting long-acting contraception. Leading reproductive health consultant Dr Asha Kasliwal has warned this may be a factor in rising abortion rates in older women. The Department of Health says local councils allocate their health budgets. Through Freedom of Information requests, the Advisory Group on Contraception obtained data suggesting that almost half of all councils in England have closed, or plan to cut, the number of sites providing contraception services between 2015 and 2019. The AGC contacted all 152 local authorities in England, with 74 (49%) saying they have reduced, or plan to reduce, the number of sites commissioned to deliver contraceptive services in at least one year between 2015/16 and 2018/19. While the most widely accessible form of contraception is condoms, and the most commonly prescribed the contraceptive pill, increasing numbers of women are asking for long-acting forms of contraception – like the coil and implants. These are more effective than the pill and the most popular form of contraception for older women – and recommended by the NHS. Between 2014 and 2016, three-quarters of councils in England had reductions in long-acting reversible contraceptives (LARCs) being fitted by GPs and walk-in clinics because fewer GPs had the time or training to fit them, leading to women increasingly having to seek appointments at sexual health clinics. Dr Louise Skioldebrand is one of only a handful of GPs still carrying out fittings in Stowmarket, Suffolk. Prof Helen Stokes-Lampard, chair of the Royal College of GPs, said: “It’s extremely concerning to hear of such large-scale cuts, or plans to cut, contraceptive services, across England – actions that will potentially affect millions of women. Access to long-acting contraception – like implants – is particularly affected. She added: “It’s also incredibly frustrating, because we’ve actually had years of improvement in the quality of sexual and reproductive healthcare in the UK; we’ve seen teenage pregnancy rates halved; we’ve seen take up of LARCs increasing. “But the most recent data shows prescriptions for LARCs – reliable, cost-effective contraception – decreasing. Prof Lampard said the way sexual and reproductive health services were organised was too fragmented. And she said the college was aware of GPs who had been running LARC-fitting clinics, but not being adequately funded to do so. Lisa Hardin from Northampton had an unplanned pregnancy while taking the contraceptive pill last year. 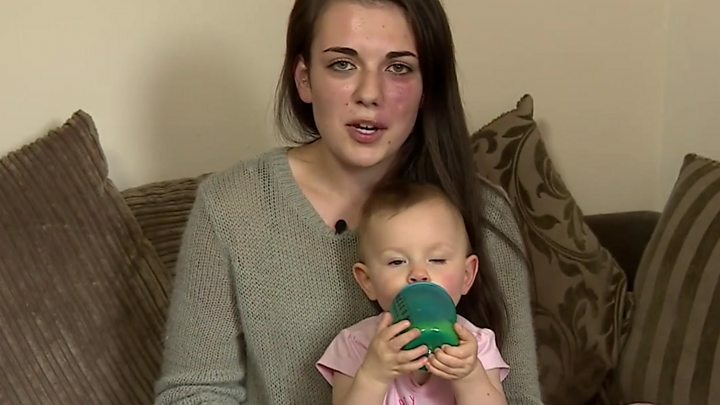 After her daughter’s birth, she wanted to get an implant, but her GP had stopped fitting them so she had to go to a clinic. The Department of Health and Social Care says it is up to local councils to allocate the public health budget – including funding for contraception services. “We have a strong track record on sexual health – sexually transmitted infections continue to fall and teenage pregnancies are at an all-time low. Are you having difficulty accessing the contraception you would like? Please tell us about your experiences by emailing haveyoursay@bbc.co.uk.